The CAMDEX RIFLE CASE PROCESSOR is the workhorse of the industry. It is shipped complete and self contained. * No additional equipment is required. It is the only product that completely transforms .223 cases into "like-new brass". 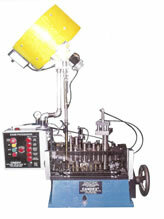 It automatically ejects berdan primed cases, split and cracked cases without stopping the machine. All cases are fully resized to assure accurate and uniform chambering. Military crimp is removed by a swaging operation on the primer pocket. The CAMDEX RIFLE CASE PROCESSOR also checks for foreign objects inside cases and for ringed cases. Processed military cases will load just like the finest commercial brass. The CAMDEX RIFLE CASE PROCESSOR is available in most rifle calibers up to and including .308. It is also possible to purchase the machine with additional caliber conversions to allow processing of more than one caliber. Automatic or Jog modes at the press of a button. Machine will automatically stop if a loaded round, object inside case or a ringed case is encountered. Berdan Probe automatically ejects berdan cases without stopping. Split and Crack case check automatically ejects split cases without stopping. Primer pockets are inspected for ringers before swaging. Primer pocket is swaged to eliminate military crimp. All cases are full length sized in the last station by a Tungsten Carbide Sizing Die prior to being ejected from the machine. Automatic Vacuum/Air Pressure monitoring system.